Scientists studying dinosaur evolution are finding many more bones to pick. Researchers from London have found hints of blood and fibrous tissue in a hodgepodge of 75-million-year-old dinosaur bones. These fossils had been poorly preserved. That now suggests residues of soft tissues may be more common in dino bones than scientists had thought. Details appeared June 9 in Nature Communications. Scientists are excited at the idea that soft tissues might still exist in most dinosaur bones. It would give them the ability to study these long-extinct animals at the cellular level. 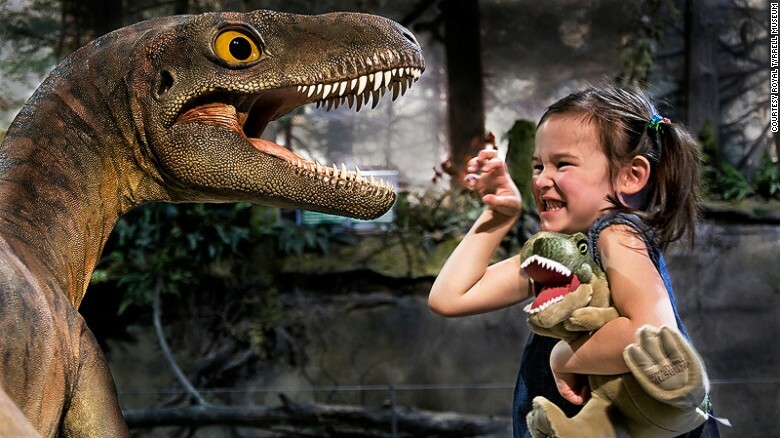 And such studies could reveal when dinosaurs switched from being cold-blooded to warm-blooded creatures. Matthew Collins is an expert in the study of ancient proteins at the University of York in England. (Proteins form the basis of living cells, muscle and tissues. They also do the work inside of cells.) Until now, scientists had thought that traces of soft tissue from dinosaurs remained only in really well-preserved fossils. “It’s exciting to think that we may have more soft tissue in dinosaur bones kicking around,” says Collins, who was not involved in the new study. Susannah Maidment is a paleontologist at Imperial College London in England. She was part of a team that has just found residues of soft tissue in slivers of eight dinosaur bones. These included a toe claw from a theropod. There also was a rib from a duckbilled dinosaur. All had been found about a century ago, mostly in Alberta, Canada. Since then, the bones had been stashed in drawers at the Natural History Museum in London. The team used a scanning electron microscope to study the bones. This special microscope can highlight features that are just a few billionths of a meter across. The dinosaur bone images revealed what appeared to be red blood cells. A second type of powerful microscope probed the structure of some bone features. These images showed bands similar to patterns formed by collagen in animal bones today. Collagen is a fibrous protein. It is found not only in bones, but also in cartilage, tendons and other connective tissues. In the late winter of 1976, the world famous fossil collector James Kitching was doing a survey near South Africa’s border with Lesotho. To his surprise he found a tiny clutch of six fossilized eggs along the side of the road at a place known as Rooidraai. It took five years for skilled palentologists to remove enough rock matrix from the eggs so that they could be preliminarily identified as the first dinosaur embryos from South Africa and the oldest dinosaur embryos in the world. Research on dinosaurs has truly blossomed in the 40 years since Kitching’s extraordinary find and a great deal more is now known about the baby dinosaurs in the eggs. But the exceptional secrets they hold are only now being fully uncovered because of developments in technology. This month the eggs were flown to Grenoble, a city at the foot of the French Alps, where they are being examined under a powerful CT scan at the European Synchrotron Radiation Facility. The secrets of the embryonic dinosaurs whose parents roamed South Africa 200 million years ago are in the process of being hatched. These high-resolution, 3D x-ray imaging methods are burgeoning in palaeontology. With advances in modern imaging methods we are now able to digitally remove rock matrix while making 3D models of the bones inside. The solution to all of these problems lies in CT scanning the specimen. The x-ray resolution needed to study the embryos is so high (six microns, or .006 mm) that only a few facilities in the world are capable of performing the study. In late 2014, a team of us put together a winning proposal to scan the eggs at the European Synchrotron Radiation Facility in Grenoble. At the facility, a huge ring of electrons (almost a kilometre in circumference) traveling at .99% of the speed of light continuously generates beams of high-energy X-rays. These beams can be harnessed with great precision to peer through rocks and image the fossils inside. Miners in north-western Canada have discovered ice age camel bones whose DNA is forcing scientists to redraw the family tree of the now-extinct species. Grant Zazula, a paleontologist with the Yukon’s department of tourism and culture, said three fossils recovered from a gold mine in the Klondike in 2008 are the first western camel bones found in the territory or Alaska in decades. Scientists had believed western camels that once lived in North America were related to llamas and alpacas common to South America, but they now have genetic proof that the animals are more closely tied to the camels inhabiting Asia and Arabia. “For us, the gold is the fossils because it’s this incredible resource for understanding extinct and ancient animals of the ice age,” Zazula said. Zazula said scientists can now begin to understand why the camels went extinct 13,000 years ago, at the end of the ice age. Behold the latest dinosaur discovery: Hellboy! The latest new dinosaur – a beast with a corona of bone atop its enormous face – has an august scientific title based on Greek and Latin roots. But researchers call it something else: Hellboy. The animal earned its impolite nickname thanks to the "devilishly hard" labor of extracting its skull from a bed of ultra-hard rock just above a river, says Darren Tanke of Canada's Royal Tyrrell Museum of Paleontology, who worked on the excavation and coined the dinosaur's moniker. Stubs resembling devil's horns above the dinosaur's eyes also helped inspire the nickname, which the animal shares with a two-horned comic-book superhero. No run-of-the-mill devil, the Hellboy dinosaur was more of a demon king. 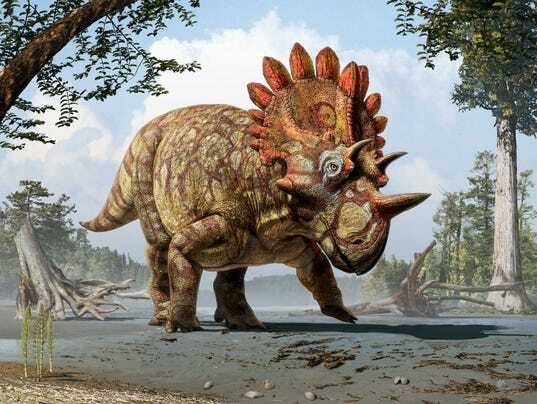 Besides its satanic horns, it boasted a crown-like ring of bony plates across its forehead, inspiring the first part of its scientific name, Regaliceratops, which means "royal horned-face." Hellboy came to light thanks to amateur fossil hunter Peter Hews, who in 2005 saw a patch of dark stone on a riverbank in Alberta. Someone else would've passed it by. Hews, a consultant geologist, thought it might be bone and sent Tanke a photo. It was a good call. The second part of Hellboy's scientific name is peterhewsi, after the man who spotted it. "I've done the easy part. I just found it," Hews says modestly. Whether finding it was easy or not, the next part was a lot harder. Researchers needed an electric jackhammer to chisel the fossil out its resting place and a helicopter to lift the 1,300-pound stone block to a truck. Researchers have called time on a growing suspicion that many dinosaurs were not the dry, scaly animals of popular conception, but fluffy, feathered beasts instead. Remains unearthed in recent years have revealed feathers or proto-feathers on a range of dinosaurs, leading some paleontologists to wonder if all of the animals evolved from a feathered ancestor and sported some kind of plumage themselves. But while many meat-eating theropods, such as velociraptors and relatives of tyrannosaurs, were clearly clad in feathers, a fresh analysis of prehistoric remains suggests that most dinosaurs were scaly beasts after all. Nicolás Campione, a dinosaur researcher at Uppsala University in Sweden, worked with scientists at the Natural History Museum in London and the Royal Ontario Museum in Toronto to survey some of the best-preserved dinosaur fossils from museums around the world. The scientists collected information on around 75 species that are known from the fossil remains of their soft tissues to have had either scales or feathers. From these, they created a dinosaur family tree and used a statistical model to work out the odds of species having feathers at different points in dinosaur history. The first dinosaurs evolved from reptiles more than 230 million years ago. Feathers are thought to have arisen more than once in dinosaur lineages, and while they live on and give flight to modern birds, feathers first emerged for other reasons: for warmth or to provide colourful plumage displays. Last year, scientists announced the discovery in Siberia of Kulindadromeus, a small, 150 million-year-old, plant-eating dinosaur that had both scales and feathers. 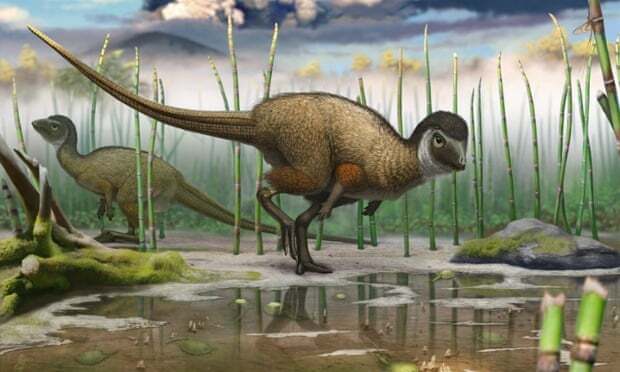 The finding of such an ancient plumage prompted the group to speculate that a fuzzy coating of feathers may have been the rule for dinosaurs rather than the exception. Some artists have run with the idea and drawn up depictions of giant feathered brontosaurs.